Cool photo. Thanks for sharing. I was looking for Dino in the photo (I don't see him). However, there are 2 people with "NERD BOSS" hats on their heads. Love that pic. 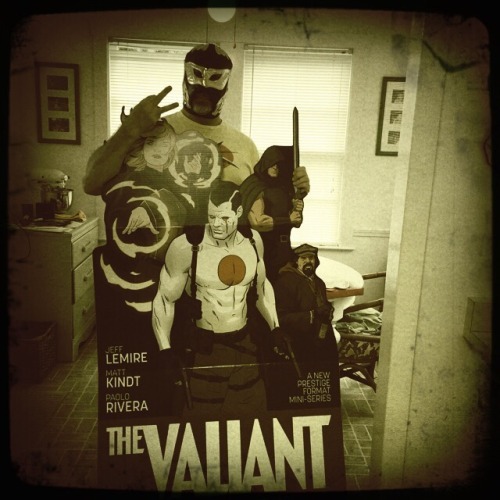 Exciting stuff for Valiant fans! Kevin Van Hook posted this on Facebook. I have a Quasar collection. And I love it. So there. 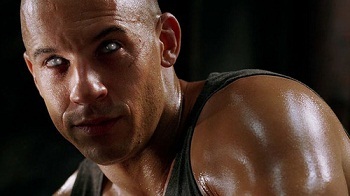 I thought Riddick's eyes were silver?!? I guess ... it looks like they drew in a bit of hair, too. My mind is sharp. Like a sharp thing. If I invested 300m on a film and it brought back 315m, I have made 5% on a large investment, but with ALOT of risk. Van Deisel big star lowers risk. 5% for such a huge investment is not worth it. Is it a flop? Bomb? No. Not quite. Production budget is only part of the equation. Marketing is typically 50% to 100% again of production budget. And of course movie theatres take their cut. Hence a movie like Justice League 'made' hundreds of millions above its production budget but reportedly actually lost money. So is justice league a flop? I suppose, for investors yes. Maybe returns will drip in over the years to break even. I think the negative online reaction to JL was undeserved BTW, and it is a film i enjoyed more than BvS for example. And don't forget to strip out sales tax (e.g. VAT in the UK). So if JL cost $300 million to make, say a conservative $150 million in global marketing, and assuming it got 50% sales for aggregate for distribution (a conservative 10% on sales tax, 40% to theatres to pay staff and overheads), then it may have lost over $120 million. To break even in that scenario above, it needed to make around $900 million which wouldn't even put it in the top ten grossing superhero films. It may have needed to make less if the studio drove a harder bargain on its cut, but even at 60% it would have needed $750 million, and that is using a low-ball marketing estimate. Last edited by leonmallett on Wed Jan 30, 2019 12:21:25 pm, edited 1 time in total. Talk about high risk, geeez. That's a lot of cash to blow, I suppose the film industry is more like trying to find the next investment unicorn. Not always. This is just tent-pole territory. Take a movie like Split which at $9 million for production probably made a huge per dollar return on investment. Even Glass is rumoured to have cost only $20 million, which means profit can be found. JL had a lot of re-shoots as execs chased a different film than Snyder was making. Aquaman by comparison was 33% to 50% of the production budget of JL and made more than $300 million more.